Tyler Locklear (left) hit a two-run home run in the bottom of the sixth to provide what proved to be the winning runs, backing the complete game performance of pitcher Paul Nixon in Curley’s 6-4 victory. 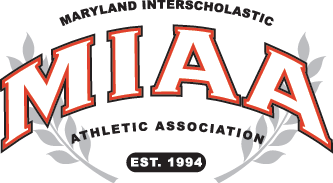 Second-ranked Archbishop Curley moved a step closer to clinching a first-round bye in the upcoming MIAA Conference baseball playoffs with an impressive 6-4 win over visiting Archbishop Spalding, in East Baltimore on Thursday afternoon. With the victory the Friars became the first area team to reach 20 wins this season. With Curley ace Paul Nixon on the hill, the No. 5 Cavaliers connected for a pair of first inning home runs and jumped out to a 3-0 lead, as Jon Brandt hit a two-run homer and Justin Caesar whacked a solo shot. Nixon would allow just one more hit the rest of the way, a seventh inning solo home run to Cory Blohm. Host Curley (20-3 overall) would answer Spalding’s opening salvo with three runs of its own, in the home half of the first, tying the game at 3-3. Hard-hitting Jaylen March doubled to the opposite field with one way, then moved to third on a wild pitch, before scoring the Friars’ first run on a single to center off the bat of Nixon. Jordan Stroud ran for Nixon and scored when Curley catcher Trent Gast-Woodard smashed a ringing RBI double down the left-field line. Dorian Allen ran for the catcher, and he scored the tying run after Nick Brown got an infield single on a ground ball to deep short. Corey Burton then plated Allen on a fielder’s choice grounder back to the mound. Nixon settled down after the rocky first inning and he went the distance to get the win for Coach Brooks Norris. After Blohm’s blast to lead-off the seventh, Nixon retired the next three Spalding batters in order to finish the game. Curley got a two-run homer from Tyler Locklear in the bottom of the 6th which proved to be the winning hit. Nixon understands, when the air warms, balls can fly out of Curley’s hitter-friendly field. They key was limiting the damage. Norris said he had confidence in Nixon, despite the rocky start. Locklear hit his two-run homer off of Cavalier starter Zach Powers, who took the loss. Now 12-2 in the MIAA A Conference, Curley is a half game back of top-ranked and first-place John Carroll (12-1). Those two, who will meet on Tuesday at Curley, are moving ever closer to top league finish which comes with a first round bye in the double-elimination playoffs. Only third-place Calvert Hall (9-4) is close enough to challenge for one of those spots. Palumbo praised Curley catcher Gast-Woodard, who gunned a Spalding base-stealer for stike-him-out, throw-him-out double-play to help Nixon escape a one out, first-and-third threat in the fifth. Spalding (12-8 overall) fell to 6-5 in the league. The Cavaliers lead Gilman and Loyola, both 7-6 after Gilman’s 10-1 win over the Dons on Thursday, by percentage points in the chase for fourth place. The third and fourth place seeds will host a home game in the first round of the playoffs. Palumbo said his team just needs to keep battling. Also on Thursday in the MIAA A Mount St. Joseph (10-13, 5-9) defeat McDonogh, 4-0. The Gaels and St. Mary’s (4-6) are both on the outside looking in at the playoff race, but still mathematically in contention. Pictured above: Curley’s Paul Nixon strides toward the plate during his complete game 3-hit victory over Archbishop Spalding. HR: AS-Brandt, Ceaser, Blohm; AC-Locklear.